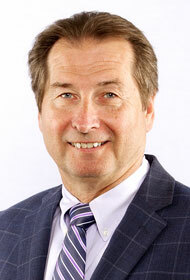 Dr. Zabrecky is the Founder and Director of the Zabrecky Institute of Biomedicine. Dr. Zabrecky is a licensed chiropractor, medical school graduate, and holds a Doctorate in Medicine. Dr. Zabrecky has been in private practice for over 35 years, during which time he has significantly contributed to the field of integrative medicine. Dr. Zabrecky's patient base extends throughout the United States as well as from many places throughout the world including Canada, Great Britain, Spain, Germany, France, Switzerland, Italy, Israel, Mexico, Egypt, Turkey, South Korea and China. Dr. Zabrecky also serves as an Assistant Research Professor at the Sidney Kimmel Medical College of the Thomas Jefferson University and Hospitals. In that capacity, he works with the Myrna Brind Center for Integrative Medicine in Philadelphia and the Marcus Center for Integrative Medicine in Villanova where he consults on the development of treatment protocols for complex medical disorders and the design of related clinical research studies to examine the efficacy of new approaches to integrative medicine. Dr. Zabrecky's unique combination of knowledge, training and experience distinguishes his approach to the evaluation, diagnosis and treatment of his patients.